Although by no means the best place to look for skiing in the Andes, there are some skiing opportunities in these four northern countries. There are a couple of tiny ski fields and some good ski-mountaineering. The big difference with the southern countries of Chile and Argentina is that all skiing in these four countries is going to be on glaciers, with all that entails. In all four countries the best snow conditions are likely to be after the end of the wet season, which for Peru and Bolivia will be in late April to June, whilst for Colombia you're probably best to try in November. 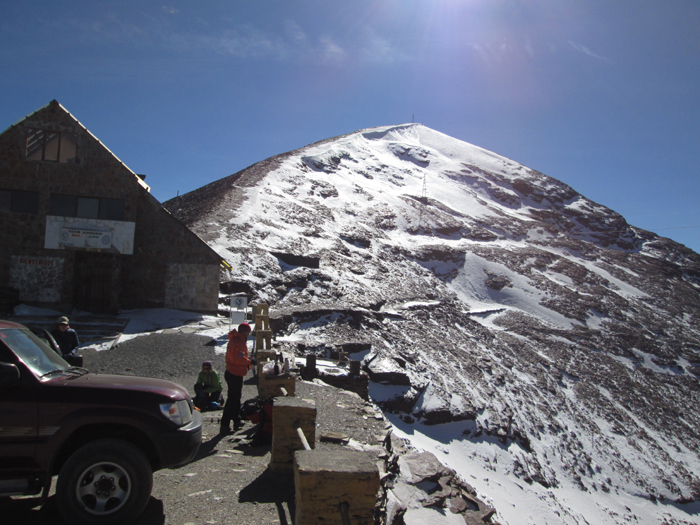 There is some limited skiing on the volcanoes of the Los Nevados range, particularly on the southwest side of Nevado del Ruiz, where there is a convenient access road to a height of 4900m. Nearby Tolima may also be possible as a ski peak. Ritacuba Blanco in the Sierra Nevada del Cocuy would also make a good ski descent. Many other areas of Colombia are at present are either very difficult or a bit dangerous to access. Skiing opportunities in Ecuador are limited to ski ascents of the countries four highest peaks, which are all volcanoes, Chimborazo, Cotopaxi, Cayambe. 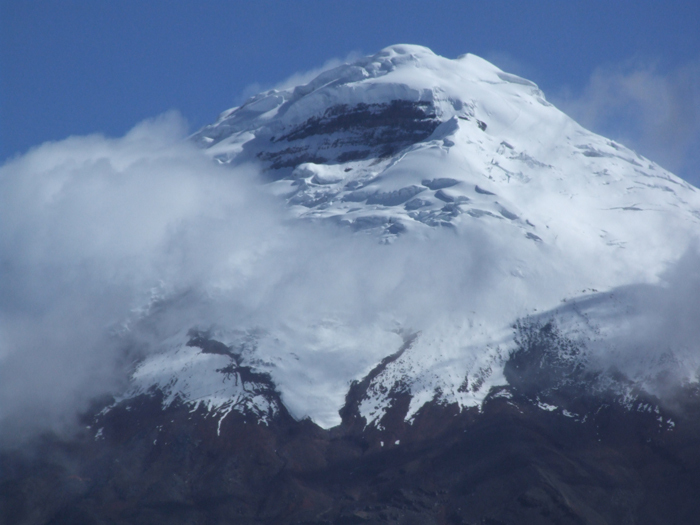 These are the only peaks in Ecuador with significant snow. Access to these peaks is easy, with huts at about 4500-5000m on all of them except Antisana. However the peaks are not the most straightforward for skiing due to some big crevasses and often considerable avalanche danger, and these days there is a legal requirement to hire a guide.... it is doubtful if there are many guides in Ecuador who can ski. There are several areas of Peru with potential for exploratory ski-mountaineering, although at present there are no ski fields or resorts. Every July there are plenty of people skiing at Pastoruri in the southern Cordillera Blanca, and various races and championships are held here. There is apparently occasionally a rope-tow in place, although I have never seen it on my three visits here. Also in the Cordillera Blanca the traverse of the 6000m peaks of Copa and Hualcan is said to make a good ski mountaineering trip, although the snow-line is a long way from the valley bottom. We can run ski trips to this range.... if you're really interested please email us for further details. The worlds highest "ski-resort" is at 5100m is on Chacaltaya mountain just outside La Paz, the capital of Bolivia. However it has not always known such good conditions recently and the glacier is retreating so fast that in ten years time no skiing at all may be possible here. 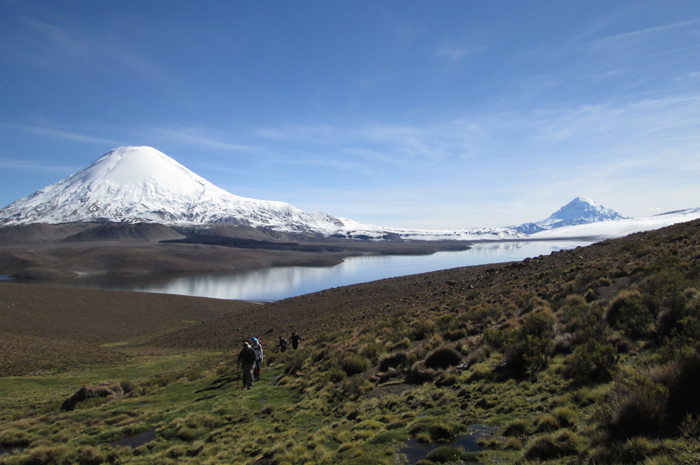 Several of the 6000m peaks in Bolivia have been skied and the volcanoes in particular can make good ski descents, including Sajama and Parinacota. Another good area is around the Khara Khota valley, a few hours drive form La Paz, which we visit on our Bolivia Ski Explorer itinerary. What's left of the ski area at Chacaltaya ski field in Bolivia's Cordillera Real. Not really enough snow to ski this year (2014), but another year things could be better! See our Bolivia Ski Explorer itinerary for details of our regular ski-mountaineering itinerary to this country.